Update 17th of May 2010: I moved in January from the Gumstix to a new FoxG20. The Fox G20 is a bit cheaper as the gumstix, runs under a standard Debian distribution and has the Atmel peripherals I know from the AVR MCU, counters and ADC. Also it has a lot more UARTs. 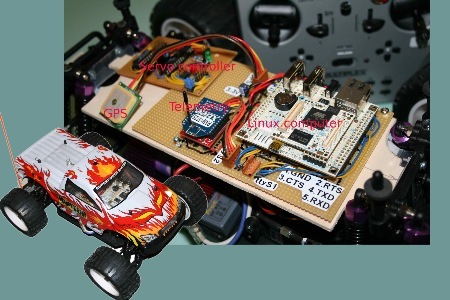 I am still fighting with the connection of the sensors to build a test platform based on an RC Car. I present here the current developments on the Horus system. 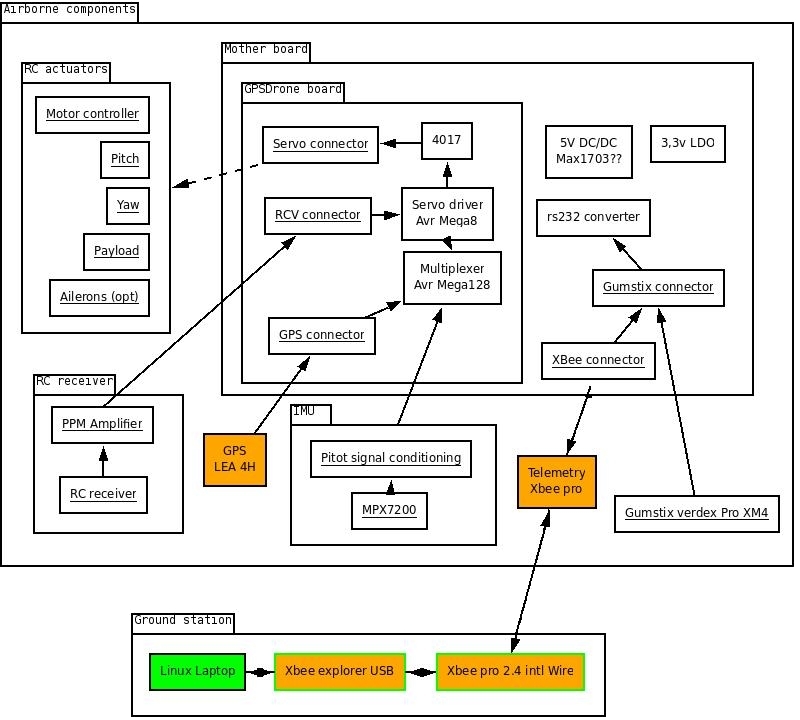 Basically I'll move the airborne mission management routing and control algorithm on a Linux platform, for the prototype I choosed a Gumstix Verdex pro. Also a new airspeed sensor prototype is working on the experiment table. The main goal is unchanged from beginning of the project: learn new things. As I started the Horus project in 2003, there were almost no other similar projects. The Paparazzi project started about the same time, and the autopilot project already stopped being really active. The choice of the Hardware was limited to AVR and PIC microcontrollers. There was just enough memory to make it run, RAM allowing the use of the GCC GNU compiler, and flash program memory to ease the develpment without burning too many chips. The situation today is quite different: a plethora of "computer modules" able to run a plain vanilla linux system with MMU, running at multiple 100Mhz are available. 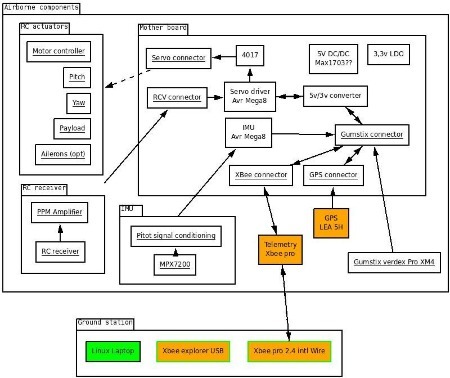 If building the specific hardware for this kind of application togehter with the corresponding kernel drivers is still a technical challenge, the rest of the application can be developped with standard programming skills, allowing even more people to jump on these projects. I believe that evolution of the hardware will bring us, in two years from now, us computer on chips which will allow the construction of an autopilot the weight less than 10g (let's bet for a Linux chip with integrated FPGA in 2011). Some have already showed the way using gumstix boards, finally we'll move to chips having ADCs and FPGA, allowing the system to run with a minimal number of external components. Also I'll try to make as much as available under the GPL license. The first visible result of this new development is a new logo, of course pingu based. The horus pingu logo was friendly created by Adrian Sonnberger. Many thanks to him! The next thing is a plan showing the prototype to be implemented on a RC Car. The base is a gumstix verdex-pro connected via rs232 to the old GPSDrone board. The UART previously used for the telemetry is now connected to the gumstix, so I'll build a new telemetry using XBee modules, which'll be directly connected to the gumstix. The XBee modules are ordered (From Sparkfun) and a brand new monster truck is awaiting its first test drive. If the order comes this week, I'll have a long ouiquenne to build the thing togehter. On the software side, I need a new multiplexing and communication program for the old GPSDrone board. 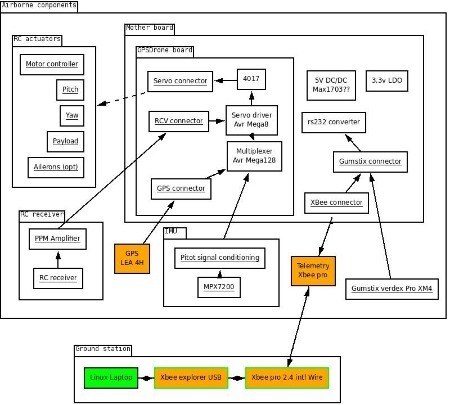 The second controller multiplexes all navigation sensors, GPS, IMU, etc... The third is the Linux platform which runs the navigation, control and mission management algorithm.